ATLANTIC CITY — Eydie Gorme slept in. But it seemed everyone else was there, or now claims to have been, when Gorme's husband, Steve Lawrence, presided over the first roll of the dice on May 26, 1978, at Resorts Hotel and Casino, ushering in a rocky four decades of legalized gambling in Atlantic City. Anthony Capri (left), a shift supervisor in security from Atco, talks with Resorts Casino Hotel CEO Mark Giannantonio, on the casino floor, in Atlantic City. Capri has worked for Resorts for 40 years. In a city where buildings and casinos can have short life spans, Resorts managed to buck the odds to be able to celebrate that 40th anniversary this weekend — in a Boardwalk building that dates back to before Prohibition. It's an Atlantic City special. An anniversary, like previous ones, bogged down by nagging questions, unfulfilled promises, and betrayed residents, by government mismanagement and casino indifference, the old tale of two cities: a billion-dollar industry perched at the literal edge of a city with a poverty rate of more than 30 percent, and a county with the highest foreclosure rate in the nation. The tide came in, the tide went out. All boats did not rise. Atlantic City’s first casino, Resorts Casino Hotel, stands in the shadow of the two newest casinos, Hard Rock Casino, formerly Trump Taj Mahal, and Ocean Resort Casino, formerly Revel. They will both reopen June 28. Resorts will celebrate its 40th anniversary on Memorial Day. Still, the stylish and friendly Resorts endured, even from its precarious perch on the northern half of the Boardwalk down from three casinos, the Revel, Showboat, and the Trump Taj Mahal, that were among the five to close since 2014, as the casino town's industry shrank from 2006's gaming-revenue high of $5.2 billion to 2017's $2.6 billion. But on June 28, two of those casinos are reopening under new brands and owners, Revel as the Ocean Resort Casino and the Taj as the Hard Rock Casino Hotel. Showboat has reopened as a non-casino hotel. A new Observation Wheel lights up the Steel Pier. Nearby is "The Beach at South Inlet," a new millennial-targeted apartment complex with a pool and amenities, nearly completed, the first new private rental housing in Atlantic City in decades. 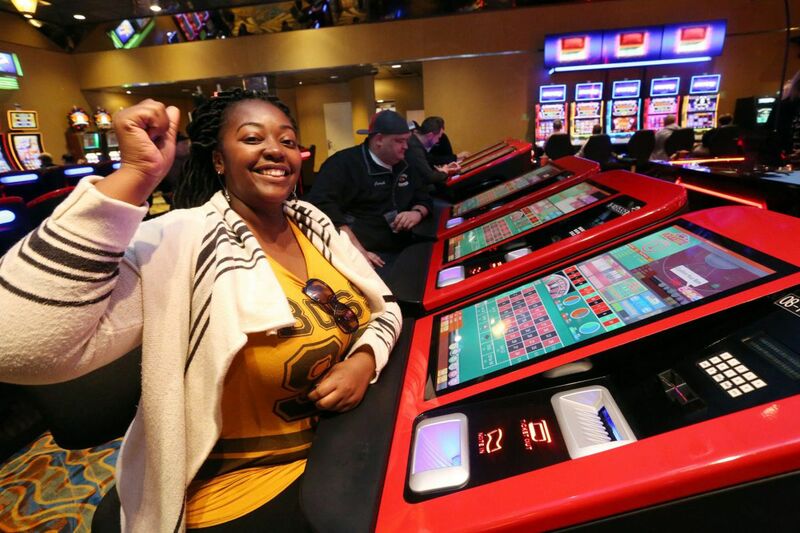 Casino workers — who weathered the loss of 10,000 jobs, fled to other jurisdictions, lost homes, floundered — are now weighing multiple job offers on the Boardwalk. Sports betting is expected to infuse new energy, bringing the untucked masses to casino sports books and new beer gardens. Pinal Shah, of Egg Harbor Township, deals baccarat at Resorts Casino Hotel. Shah says she now has several full-time job offers. From the vantage point of Resorts, 40 years has left the casino well-positioned, and not just by virtue of being next door to the Hard Rock. Now owned by businessman Morris Bailey and operated by the Connecticut-based Mohegan Sun, with a partnership with Jimmy Buffett and his Margaritaville brand, Resorts has survived decades of an industry in which Atlantic City's original East Coast monopoly now seems quaint. "I guarantee you Resorts will be here in 40 years," Giannantonio said. But the coming expansion of the contracted industry has some predicting fresh casino obituaries. Caesars, parent company of Caesars, Bally's, and Harrah's casinos in Atlantic City, told shareholders to expect a $40 million decrease in cash flow this year. Steven Perskie, the legislator who wrote the Casino Control Act and who took advantage of Gorme's absence to nestle in next to Lawrence for the historic dice roll ("Queen of Resorts Reigns Again," the local paper trumpeted), says the expansion, while welcome, could trigger another round of "rightsizing." Perskie says it's not casinos but government that didn't hold up its end of the gaming bargain. "The casinos were not expected to redevelop Atlantic City," he said. "They were to make major investments in money, turn over millions and millions of dollars to the government, and run an honest operation. That's what they did." City and state government misdirected casino taxes, neglected basic improvements to Atlantic City, and failed to diversify the city's economy until it nearly collapsed under the weight of a casino market that had spread well beyond New Jersey and then shrank. Gamblers line up outside Resorts International Casino for opening day of the first Atlantic City gaming hall on May 26, 1978. With gaming meant to be a "unique tool of urban redevelopment," the state turned to the Casino Reinvestment Development Authority, a board appointed by the governor, to divvy up a 1.25 percent tax on casino revenue. The CRDA helped build the Convention Center, the Walk outlets, housing in the Northeast Inlet, and other projects, but also sent money up north. Eventually, the state law allowed casinos themselves to draw down the money. Now, with the city under state control, CRDA money is paying Atlantic City's municipal debt. "A lot of the revenue that should have gone into Atlantic City went out of Atlantic City," said Carol Ruffu, of the Chelsea Neighborhood Association. Ruffu lobbied for the casino act in the 1970s, stood in line among the jacket-and-tied men the first day, and, more recently, led the effort to keep the city's water authority under local control. Parking revenue and room taxes went to the state, not the city. Casinos did not uniformly look to Atlantic City residents for hiring, though that has improved. As of March, all casinos except Borgata had more employees from Atlantic City than any other municipality, with a total of 4,130 Atlantic City residents employed by casinos. Hard Rock and Ocean Resort have signaled a commitment to hire, train, and apprentice local residents, and to be active in the community, as has Stockton University, which is opening a city campus and dormitory this fall, and South Jersey Gas, which is relocating to a new tower. In March, Hard Rock and Stockton developer Joe Jingoli even wrote a $25,000 check to keep a homeless day center afloat. A view from the beach looking at Resorts International Casino in Atlantic City, May 1978. It was the first NJ casino and it opened May 26, 1978. "I think there was an opportunity for a whole lot of us to be homeowners and buy cars and send our kids to colleges," says Ernest Coursey, an Atlantic County freeholder and former city councilman. "It certainly had a great impact. We don't think we got our fair share of what they promised us." James Kennedy, a former CRDA executive director, says the region is starting to recover jobs, but notes that many of those are low-wage. May numbers show about 21,515 employed in casino jobs in Atlantic City, 16,200 of those full time. (AC casino employment peaked at 49,123 employees in 1997.) In Atlantic County, 48 percent of households are considered "working poor." "Who are these working poor?" Kennedy said on Twitter. "A lot of them are the housekeepers, cooks and employees that comprise our Casino Leisure & Hospitality workforce." Pinal Shah, a baccarat dealer at Resorts whose husband works at SugarHouse in Philadelphia, raised two children and bought a home in Egg Harbor Township on the strength of casino careers. She is hoping for a return to the flush years. "Right now, everybody has three, four full-time job" offers, she said. "Everyone's applying everywhere." As CEO, Giannantonio says he cultivates an atmosphere akin to the lively home he grew up in with very social parents. Resorts Casino Hotel CEO Mark Giannantonio talks with longtime customer Rosemarie Haeger, 85, of Staten Island, NY, on the casino floor, in Atlantic City. Haeger first visited the casino during its first week of operation 40 years ago and has been coming ever since. Mays drives past casinos on his way from Virginia to find his comfort zone at Resorts, which, he notes, has a walkway leading directly to Hard Rock. Bruce Mays, of Gloucester County, Virginia, talks about why he is a loyal customer to Resorts Casino Hotel, in Atlantic City, in the VIP Services Club. On Friday, Resorts will do its annual Memorial Day weekend beach-ball drop and reenact the historic roll of the dice. And this ever-dramatic town will embark on its latest steep ride up the roller coaster, everyone's hands outstretched, waiting to feel, once again, the wind in their hair. "I've seen the ups and downs," said Ruffu, whose grandfather was mayor of Atlantic City in 1927, facing off anti-vice groups until 1930, when he was struck and killed by a train in Absecon returning from a political gathering. "I'm always pro-Atlantic City." Fifteen casinos have operated in Atlantic City since the first, Resorts International, opened in 1978. Seven are currently in business, and two currently shuttered properties — Revel and Taj Mahal — are expected to reopen under new owners and names later this summer. The timeline below shows the life span of Atlantic City casinos. The label show the original names of the properties. Roll over or click on the bars for more information.